(Newser) – German police say they're "in disbelief" over a false story published by Breitbart, which a local publication claims was trying to create "an image of chaotic civil war-like conditions in Germany, caused by Islamist aggressors." 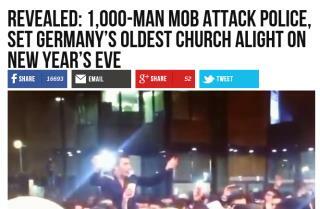 The AFP reports Breitbart ran a story titled "1,000-man mob attack police, set Germany's oldest church alight on New Year's Eve." The article claimed a mob gathered "around the flag of al-Qaida and Islamic State collaborators the Free Syrian Army" while chanting "Allahu akbar." The story also claimed people threw fireworks at families, children, and police, heavily suggesting Muslim migrants were the culprits, according to the Washington Post. It was a strange report considering police in Dortmund, where the events supposedly took place, say it was an "average to quiet" New Year's Eve. Ladies and Gentleman, we bring you Stephen Bannon; Chief strategist of the trump cabinet and former head of Brietbart News; The lowest, lying, Nazi scum on the planet made a news publication and here it is. Full of pure bull$hit for the dumbest people in America.